Nevertheless tonight called for something sans meat, but still tasty and filling. And let me tell you - these spicy veggies are awesome - just the right amount of heat with an exotic blend of spices that'll make you return for more. And if you don't trust me, ask TheHusband, the vegetarian sceptic, who asked for seconds. TheWoman = 1. TheHusband = sated. See, it's a win-win! 1. Arrange vegetables in a ovenproof dish. Sprinkle with garlic, spices, oil and honey, distributing evenly and place in the oven at 180C for 30 minutes. 2. Meanwhile, dissolve the stock cube in a cup of water. Add couscous and let rest for 6 - 7 minutes. Fluff with a fork, then stir through oil and lemon juice. Season to taste. 3. 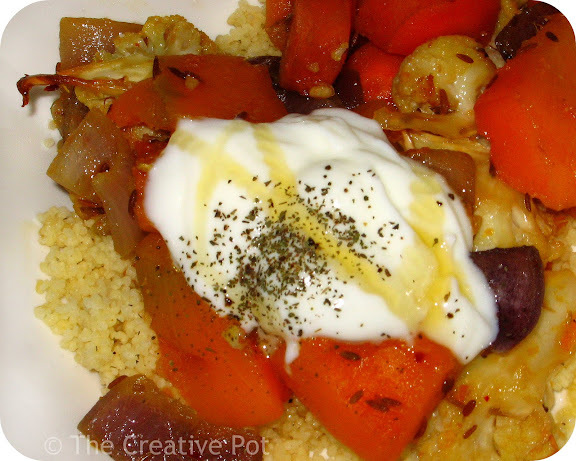 Serve roasted vegetables on a bed of couscous and top with a scoop of yogurt, drizzle of honey and a sprinkle of mint. It is the funniest thing, I had a packet of couscous in my hand last night, but opted for brown rice instead. Luckily, now I can try your recipe tonight!!! OMG I can not wait to try this. I have a happy row of small pumpkings just waiting for some action. I have been stocking up for winter since our local farmers market is about to close for the year. Add that to the fact that we have meatless days 365 days a year. Looks beautiful!